Inspiring Women in Science and Technology, Encoded as Puzzles! 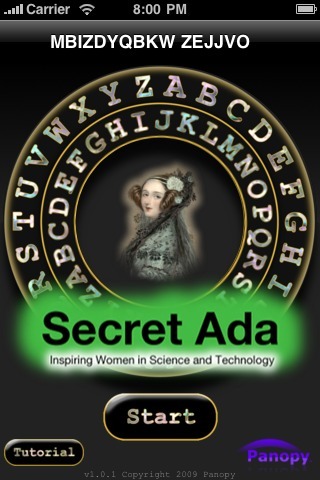 Secret Ada is a collection of short profiles of the work of inspiring women in science and technology. But you can't just read these profiles. You have to decode them, because they are encoded as cryptogram puzzles. Secret Ada was programmed by a geek dad who hopes to introduce his children to the joys and benefits of science and technology. Children get many cues about their potential roles in society - from peers, teachers, parents, and media. Sometimes we could do a better job of helping girls - and boys, too, for that matter - to understand not only how much women contribute, but also how much fun it can be to be involved in science or technology as a career. Sound interesting? If you have an iPhone or iPod Touch, please visit the Secret Ada page on the iTunes App Store to learn more (link will open in iTunes). Menu Screen: The code wheel shows the concept of shifted alphabets used to encode a simple cipher. In Secret Ada, the alphabets are also scrambled, not just shifted. 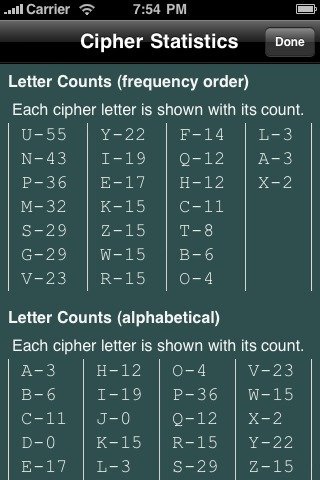 Not to worry; cracking a cipher is not as hard as it looks. New users should start with the tutorial to get all the important tips. Solving Screen: The cryptogram text (the cipher) is shown in a scrollable view on the top half of the screen. Correct guesses are marked as green; incorrect guesses are marked as red. Guesses are not marked as correct or incorrect until a check is done. On the bottom are the wheels you use to make your guess for each letter. Touch the right or left buttons to page through the alphabet to reach all letters. By touching the letter bar above the wheels, you can temporarily move the wheels off the screen so you have more room to view the cipher text. This helps you see patterns in the text, and discover words you can guess. 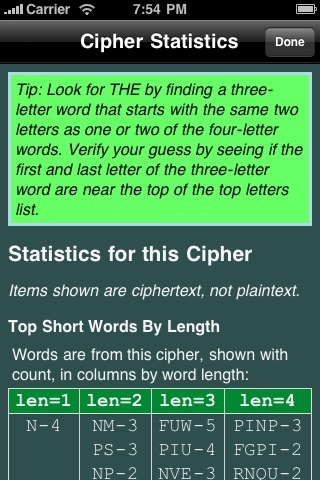 The Stats screen shows which words and letters appear most frequently in the cipher text. It also displays a different random tip each time it is loaded. Further down on the Stats screen are lists of all letters in the cipher, showing which letters appear the most. If you know that the most common two letters in English are E and T, you can use the letter counts to guess which cipher letters represent those two plaintext letters. 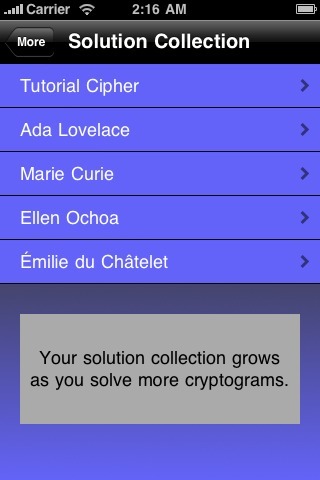 Your Solution Collection grows as you solve more cryptograms. Each item is a profile about an inspiring women in science or technology. When you are in the app, touching any item will load the full solved text in a new screen. Once solved, each profile appears in your solution collection and can be read at any time without cracking the puzzle again. Introducing young people to role models in science and technology careers is a Good Thing! Help support the cause - if you are a Twitter user, please let your Twitter followers know you are checking out Secret Ada - Thanks for taking a few seconds to do this!